We're food people sharing our passion. With 90+ years of combined culinary experience on the Kilted Chef team, we love sharing our knowledge about the beauty of food and the business of food. From inspiring folks with mouth-watering recipes and cooking tips to creating one-of-a-kind culinary experiences to corporate consulting services that help local food business grow, local is at the heart of everything we do. Alain Bossé, also known as the Kilted Chef, has travelled the world from kitchens to convention centres sharing his expertise and love for buying and eating local ingredients with people near and far. With his signature tartan kilt, proud Acadian heritage and undeniable flair for cooking with local, he has earned a reputation as Atlantic Canada’s culinary ambassador. Alain’s philosophy is pretty simple – He loves local ingredients and firmly believes that if you live local, buy local. It’s a message that he’s been spreading around the world and here at home in Atlantic Canada for more than a decade. Alain is proud to have developed relationships with regional producers, processors, artisans and farmers. These people mean everything to the man who passionately believes in eating locally grown products. The Kilted Chef has more than 35 years of culinary experience under his belt…excuse us, we mean kilt. Diploma in Culinary, Food & Beverage Administration, Accommodation, (2-year diploma) L’Ecole Provinciale d’Hotellerie, Edmundston, N.B. 15 years as General Manager and Corporate Food and Beverage/Chef Manager for the Wandlyn Inns 11 corporately owned and 10 franchise properties. 10 years as General Manager of Pictou Lodge Resort, Director of Food and Beverage Operations for Maritime Inns and Resorts and member of the management committee of Maritime Inns and Resorts. Regular guest instructor at the Louisiana’s John Folse Culinary School, Cordon Bleu School in Miami Florida, Boston, California, Henry Ford College, and The University of Culinary Art in Boston, Mass. Chef Alain has cooked for dignitaries including Prince Charles and Dr. Condoleezza Rice and has worked in kitchens and on event stages alongside top chefs from around the world including Jamie Oliver, Chuck Hughes, Anna Olson, Michael Smith, Frank Widmar, and Michael Reith. He firmly believes that if you live local, then you should buy local. It’s a philosophy that is apparent in everything he does, whether it be cooking classes, recipe development, public appearances, writing, restaurant or food industry consulting. For more than 10 years, Alain has used his bon vivant personality to represent Atlantic Canada and to promote local commodities such as lobster, mussels, apples and wild blueberries to name a few. His travel has included trips across South America, North America, Europe and Asia too, giving presentations that are both enlightening and entertaining to chefs, future chefs and owner- operators on the use of Atlantic Canadian products and their flexibility. Alain also runs a busy consulting business (Alain Bossé Consulting) where he helps restaurateurs and producers with everything from menu/recipe development and restaurant makeovers to product endorsements and motivational speaking engagements. Alain has also been a frequent guest instructor at the Louisiana’s John Folse Culinary School, Cordon Bleu School (Miami, Boston and California), The Henry Ford College, and The University of Culinary Art in Boston to name a few. His lectures and demonstrations have focused on “Lobster and or Mussels 101”, which educate students on the use of sustainable Atlantic Canadian seafood. An in-demand speaker, educator and entertainer, Chef Alain is a frequent guest on radio and television, a prolific recipe creator and food writer. In addition to contributing to his own website and engaging with his more than 20,000 social media followers, Alain is a full-time contributor to the Advocate group of publications and the food editor for Saltscapes Magazine. 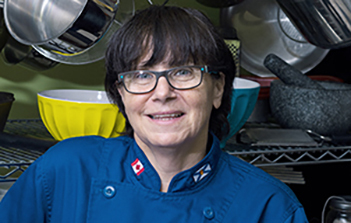 Alain has also collaborated on and authored several cookbooks including French Taste in Atlantic Canada and Mussels, featuring over 100 recipes using this tasty bi-valve. When Alain is not writing, travelling for special events and appearances or working as a food industry consultant, he’s busy at home offering private group cooking lessons and culinary tourism experiences at his farm in Nova Scotia. Chef Alain is more than a food expert; he is a food industry expert. He graduated from the Culinary, Food & Beverage Administration, Accommodation program at L’Ecole Provinciale d’Hotellerie in Edmundston, N.B. and furthered his passion for food by taking culinary classes at night. His experience in the kitchen and with senior management roles in the food & beverage industry allows him to share his expertise on the beauty of food and the business of food. The Kilted Chef’s passion for learning has never stopped. Whether it’s a new ingredient, cooking technique, safety regulation or other industry development, Alain works to keep his knowledge as sharp as his knives. Alain’s industry leadership also includes serving as the president of Taste of Nova Scotia for five years and as an active member of the Board of Directors. He is also a collaborator with Select Nova Scotia, a buy local organization. If you haven’t had the chance to meet the Kilted Chef yet, you should. You’re guaranteed a uniquely educational, inspiring and unforgettable experience. Joanne BosseCooking, Baking & Pastry. Front of House. 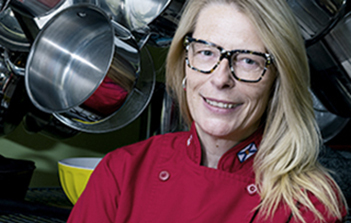 Johanne has been part of the Kilted Chef team since day one. Not only is she an awesome asset to the team, she also keeps me grounded. After all, we are just cooks at the end of the day. Johanne started working in the hospitality industry during high school and kindled a passion that never went away. For the past 30 plus years Johanne has managed tea rooms to high-end dining rooms including many weddings and events. She is very well versed in the culinary world. Johanne has stood by my side, helping create a brand that today is recognized worldwide. Not to mention her baking and pastry skills are a great asset to our team. Lisa is a cool, all-around great chef with a passion for learning, she truly is a great asset to the team. Lisa graduated from Pictou Academy and then went on to obtain her Red Seal from NSCC Akerley Campus in Halifax NS. She then pursued her culinary career in a wide variety of restaurants from fine dining to bakery/coffee houses. She’s been married to her husband Rick for 30 years and they have 2 daughters, Becky and Diane.